Ever hear anyone exclaim, “Oh, fudge!” when they’ve screwed something up? Like the Slinky, the Post-It note, potato chips, and penicillin, the dense candy-like treat known as fudge is believed to have been a mistake. According to legend, a confectioner flubbed while trying to make caramel, but ended up creating something just as tasty. 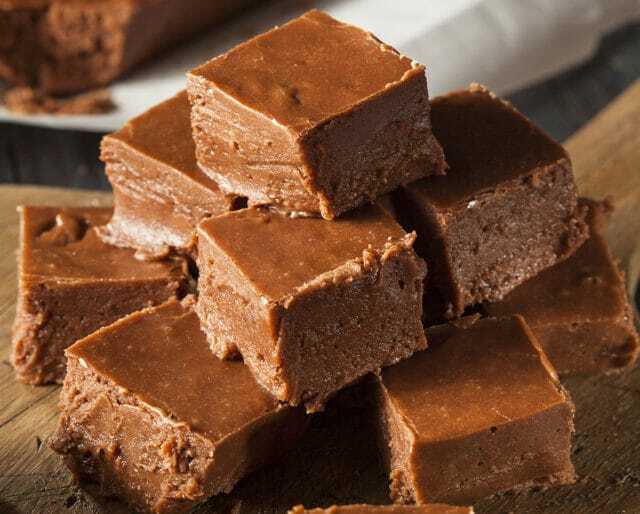 We celebrate this happy accident on June 16, which is National Fudge Day. Fudge also has historical ties to female scholars in the late 19th and early 20th century, when recipes for it spread like wildfire among students at women’s colleges such as Vassar, Wellesley, and Smith. One student made 30 pounds of the stuff for the Vassar Senior Auction in 1890! Mackinac Island, Michigan is 4.35-square-mile island that is home to over a dozen shops dedicated to fudge, even though its permanent population only hovers around 500 people. While the famous fudge destination’s celebration doesn’t coincide with National Fudge Day, it doesn’t need to. Plenty of folks make the trek every year to see the fudge-making process, try fudge-infused cocktails created by local mixologists, run in a sugar-sack relay race, or look for one of several “golden tickets” hidden inside boxes of fudge, which entitle winners to a free-vacation package. The festival occurs in April, plenty of time to book your tickets, and maybe get in a few extra hours on the elliptical in preparation. Wait, what? Ice cream on National Fudge Day? Yep. After all, you can’t have hot fudge sauce without, well, fudge. The sauce that you spoon over ice cream and top with whipped cream is essentially the same as regular fudge, except that it never sets -- a mistake made out of a mistake, in other words! Until the advent of fudge, the only options for topping your ice cream were plain ol’ chocolate sauce and sauces made from fruit. Nothing wrong with a strawberry sundae, of course, but we have early fudge fudgers to thank for this most iconic of American ice-cream treats. It’s always fun to treat yo’self, but think about what a delight it would be to receive a box of handmade fudge as a present. It doesn’t take any longer to cook up a double batch than a single one, so save half for yourself and deliver the rest to a friend or loved one. Take some fudge into the office (if you like your co-workers) or to your local firehouse or nursing home, to spread a little sweet cheer. Not confident about combining open flame and melting sugar? Almost every fudge shop will happily ship their product anywhere in the world. That way, you can also choose a sampler pack of several different flavors. Chocolate is probably the most well-known flavor of fudge, simply because chocolate itself is so universally beloved. Besides chocolate and its variations (chocolate peanut-butter, chocolate mint, chocolate cherry, chocolate walnut, German chocolate), you can pig out on pumpkin pie, maple walnut, vanilla, coconut, blueberry, cherry, raspberry cheesecake, cookie dough, gingerbread, amaretto, Kahlua...need we go on? Suffice it to say that unless you had your sweet tooth extracted by the dentist at a very young age, you’re going to find a flavor of fudge that appeals to you. Perhaps because it’s closer kin to candy than to other treats like cookies or cakes, fudge has a reputation for being finicky and difficult to make. That may well stem from its late-19th-century history, when it often would have been made on a wood-fired stove and without the benefit of candy thermometers. Nowadays, we have precise temperature control, accurate measurement, and ingredients — corn syrup, marshmallow fluff and condensed milk — that make whipping up a batch of fudge a veritable snap. Unlike some seasonal delicacies (think crawfish, Hatch chilies, corn on the cob, pumpkin-spice lattes), fudge is appropriate and appetizing the year ‘round. Sure, there are seasonal flavors, but one appeal of this treat is that it’s good in summer or winter; as a gift, a party offering, a potluck contribution, or just a bite-size dessert that will truly satisfy with its richness. And did you know that fudge freezes fabulously? That means you can make a nice big batch of your favorite variety, package it up into portions, and tuck it away behind the TV dinners and frozen peas for those emergencies (like, you know, the average Tuesday) when you need a little something sweet.